For most of Harka Khadka’s 36 years, political empowerment has meant the right to speak his own language, practice his own religion and live in his own country. These days, Khadka simply wants a say in how Burlington cleans its streets, provides electricity and runs its schools. One of nearly 6000 refugees to resettle in Vermont since 1989, Khadka might soon find himself casting a ballot in Burlington elections — despite the fact that he is not a U.S. citizen. If a proposed change to the city’s charter moves forward, Burlington could become one of only seven cities in the country to allow resident noncitizens to vote in municipal elections. For Khadka, who was expelled from his native Bhutan and lived for 17 years in a Nepalese refugee camp, even the right to weigh in on local zoning matters would represent an important step on a long journey from political repression to civic participation. “To be a member of a community means being able to participate in all different kinds of decision making, like keeping the city clean, about things like parks and recreation. I think this is all very important,” he said. With one child enrolled at Burlington High School and another soon to begin elementary school, Khadka does not want to wait the five years it takes for refugees to apply for citizenship — he has lived in the U.S. since 2008 — before he can have a say in his children’s schools. Progressive City Councilor Vince Brennan, whose Old North End district is home to many of the city’s recent immigrants, plans to bring the issue of alien suffrage before the council on January 9. His resolution would initiate the process of changing the city’s charter to allow those who have lived in Burlington for a year to vote in local elections. Brennan’s resolution would also order a nonbinding referendum in March to gauge popular support for the idea. A second, binding vote would be required, as would approval by the state legislature. “This would be an opportunity to have more people at the table, more people having a voice,” Brennan said. Burlington’s last effort to grant alien suffrage fizzled in 2007 without ever getting to the council. Since then, a number of other municipalities have approved similar laws. Six towns and cities in Maryland allow noncitizens to vote in all local elections, according to Immigrant Voting Project cofounder Ron Hayduk; Chicago allows noncitizens to vote in school elections. Similar movements have found varying degrees of success in Massachusetts, Maine and California, and just last week the mayor of New Haven, Conn., proposed allowing noncitizens to vote in his city’s elections. Councilor Brennan cites Vermont’s own history of allowing noncitizens to vote as precedent for what might, on its face, seem a radical change. Until 1828, when the Vermont Constitution was amended to require citizenship, the only prerequisites for voting were residency in the state for a year, land ownership and the recitation of the Freeman’s Oath. Whether Vermont’s towns and cities can deviate from the state’s current definition of a voter is a murkier question. According to a legal memo prepared for the city council’s Democratic caucus, an 1863 lawsuit tested the question and found that municipalities could, at the time, carve out separate voting criteria. The case concerned an unnaturalized Irish immigrant named Patrick Duane who was elected to tax-collecting posts in the town of Winhall. When an unhappy taxpayer sued, claiming Duane was ineligible to hold office as a resident alien, the Vermont Supreme Court drew a distinction between state and local voting requirements, ruling that Duane, as a Winhall property owner, was within his rights to vote and hold office. Democratic City Councilor Ed Adrian believes the issue is far from settled. Given the changes in election law since 1863 — most notably the striking down of property ownership as a voting requirement — Adrian argues that Burlington would find itself in court if it expanded its voter base to include noncitizens. “My sense is it’s an unclear issue, and, as you know, we have a lot of lawsuits going on in the city, and we don’t need to manufacture another one,” he said. Adrian further argues that changes in voting criteria ought to be made at the state level, not town by town. Supporters of alien suffrage such as Khadka see the expansion of voting rights in a historical light. “I know for many Americans the idea of noncitizens voting might provoke a sense of outrage because for some people the right to vote distinguishes a citizen from a noncitizen. But it’s important to remember there was a similar sense of outrage about the idea of women and blacks voting. And there was a transformation over time,” he said. 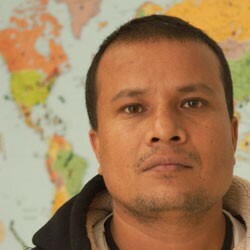 Like many Bhutanese immigrants to Burlington, Khadka is a member of the Lhotshampa minority, an ethnic group of Nepalese descent that lived in southern Bhutan until the late 1980s, when the ruling northerners cracked down on local customs and expelled close to 100,000 of Khadka’s people. After leaving the country in 1992, Khadka studied political science and worked as a teacher during the years he lived in a Nepalese refugee camp. Now he hopes that if members of his community can vote in their adopted city, they will develop civic skills and a sense of inclusion in Burlington. Judy Scott, the director of the Vermont Refugee Resettlement Program, which provides placement and support for refugees in Chittenden and Washington counties, agrees. “A crucial part of our role for our clients is to help inform them and educate them about Vermont and about America in general. So something like this is a great opportunity to do just that,” she said. By definition, Scott says, the new Vermonters she works with have very little experience exercising political power. Born in Somalia and raised in Kenya, Ahmed Omar moved to Vermont in 2003 and graduated from Burlington High School. Now a store manager at Brixton Halal on North Street and a personal trainer at the YMCA, Omar is in the process of applying for citizenship. He said he loves living in Vermont, but does not feel he has a voice in his city’s government. Suelan Selman, who moved to the U.S. from Trinidad 20 years ago and now works as a data coordinator for the Association of Africans Living in Vermont, says that gaining the right to vote in local elections would provide an incentive for her to become more informed about her community. Democratic City Councilor Norman Blais has a different take on the proposed resolution, which he plans to vote against. The son of immigrants from Québec, Blais watched his mother delay seeking citizenship for years — until he and his brothers turned old enough to vote themselves. Blais believes that the promise of voting is an important force to motivate legal noncitizens to pursue full citizenship. Ask the Candidates: Should Noncitizens Get to Vote? What do Burlington’s mayoral candidates think about noncitizens voting in local elections? We asked Republican Kurt Wright and Democrat Miro Weinberger. Neither candidate would commit to a firm position — but nor did they outright reject the idea.